The rapper clarified his situation on Twitter. 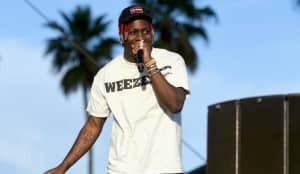 Lil Yachty has clarified remarks he made on Tuesday about whether or not he is signed to a 360 deal with Capitol Records. The question of the rapper's contract happened on Complex's Everyday Struggle web series, hosted by Joe Budden. While on the show, Budden asked Yachty, "Are you in a 360," meaning is the rapper signed to a deal whereby the label gets a cut of every source of revenue coming in. Basically, is Capitol getting money every time Yachty's Target commercial comes on. Yachty seemed confused by the question, saying, "I don't know," and then seemingly looking off camera to ask, "Am I?" When pressed further, the rapper said, "I know I have an amazing deal. I know I have an amazing attorney." Budden then proceeded to explain what a 360 deal is, and then turned to the rapper to ask how he felt about them. Yachty, who appeared flustered, said, "I already recouped my deal," and explained that he had already made back his advance which was "over a million." After the interview, Yachty took to Twitter to clarify his statements. "Y'all gotta understand just because I didn't know the term name '360 Deal' Doesn't Mean I Don't Know What Kind Of Deal I Have," the 19-year-old wrote. Y'all gotta understand just because I didn't know the term name " 360 Deal " Doesn't Mean I Don't Know What Kind Of Deal I Have. I Only Wasn't Aware Of The Term "360 Deal".. I Own All My Publishing & Ive Recouped My Deal. For those So Pressed. Chill. I'm Good. In a follow up tweet, Yachty wrote, "I Only Wasn't Aware Of The Term '360 Deal'.. I Own All My Publishing & Ive Recouped My Deal. For those So Pressed. Chill. I'm Good." You can watch Yachty's full interview on Everyday Struggle above. The comments about the 360 deal start at the 15-minute mark. Yachty's album, Teenage Emotions, comes out May 26.